It happens every year at around mid winter, and stretches out until early spring. I develop a yearning for warm days and clear nights. A need to swap the cold hard tiles of home for something warm and soft; something like the dusty red sands of the desert. So this winter, that’s precisely what I did. A bit of gravel under the tyres for that feeling of freedom! Having not done a lot of exploring to the east, I went and grabbed a set of maps to cover the goldfields region of Western Australia – paying particular attention to any township marked as “abandoned” or “ruin”. After pouring over the maps for a few hours, I began to realise that the route I was plotting pretty much exactly followed the route of the golden quest discovery trail, missing a bit here and poking in a bit of my own discovery trail there. On the 11th of September we kicked the tyres (good thing we did, as mine were flat) and headed east for a place called Kunanalling, where nothing remains but the ruins of the old hotel where a thriving gold mining town once existed. Kunanalling is situated 35 kilometres North of Coolgardie along a well maintained gravel , or a touch under 600km from Perth; a reasonable days drive. I got a lot of information for this trip from Marc’s website, WA Now And Then; and the Kunanalling ruin looked like a top spot to camp for the night. The stars were brilliant, and the ruins made an interesting photo subject at night. Be careful wandering around in the dark though; there are abandoned mine shafts EVERYWHERE! On day two we stirred early, eager to get on the road and explore some ghost towns or poke around some abandoned mines. Before heading through Ora Banda and Siberia though, we made the call to detour about 20 kilometres and take a look at Rowles Lagoon. This would have been our other option for camping had Kunanalling had proved unsuitable. Rowles Lagoon is an awesome place! 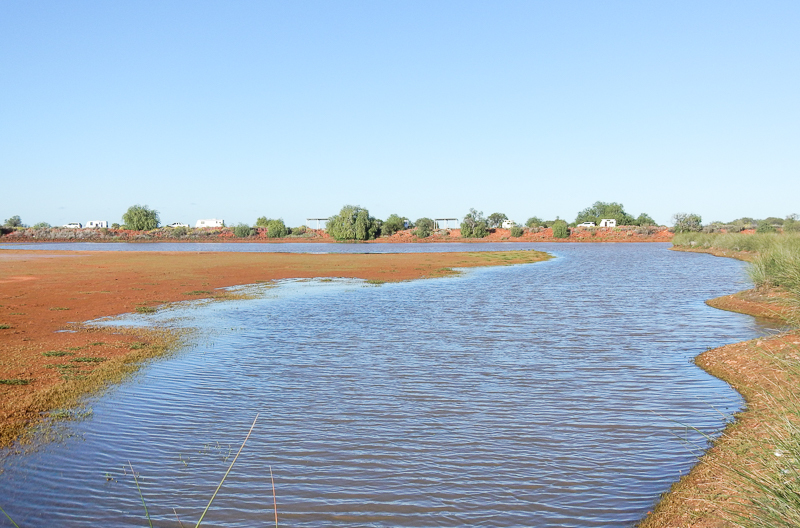 From Kunanalling, Rowles Lagoon is located approximately 40 kilometres further along Coolgardie North Road. The freshwater lake was full to the brim with fresh, clear water and teeming with bird life. A few picnic shelters are dotted about the place, and the campsites are set among the shady gum trees with fire pits, picnic tables and some of the least stinky pit dunnies I’ve ever encountered. Definitely one to come back to and spend a few days taking in the serenity. I could happily spend a few days relaxing here! Back tracking a little way in the direction of Ora Banda we managed a decent pace on the well maintained gravel road. I thought little of this one bend which seemed a little more corrugated than the rest when BOOM! This pub just flew up out of the dust in the middle of the road! That is literally how the Ora Banda pub comes up at you, and this iconic desert pub is virtually the only thing left of the old mining town. Accommodation is available, both powered and unpowered sites. We didn’t hang around too long, the place was packed with some event going on. We took a quick look at the pub, and the state battery which is apparently due to be opened as a museum sometime; and we moved on to Siberia for lunch. The gold battery at Ora Banda, supposed to be a museum soon! Sounds like a long drive right, all the way to Siberia for lunch! Siberia was apparently named after the country as an ironic joke for its inhospitable nature, and the place tells an excellent story of just how the hunt for gold drove people to insane measures. For a little further reading, check out this story of madness by following THIS LINK. We opted to have our lunch under what little shade could be found, and spent a good chunk of time exploring the landscape pock marked with mineshafts. Aside from the old mines, there is very little sign of a town or even a mining camp remaining. Throwing rocks down mine shafts. Some of these are incredibly deep! From here there were a few options to spend the night. Stay in Menzies and head out to Lake Ballard in the morning? Or head on to Leonora for an early morning visit to the old mining town of Gwalia? Both of these sights we had planted into our schedule and neither was to be missed, but after rocking up at Menzies to find a whole lot of not much; we opted for Leonora. 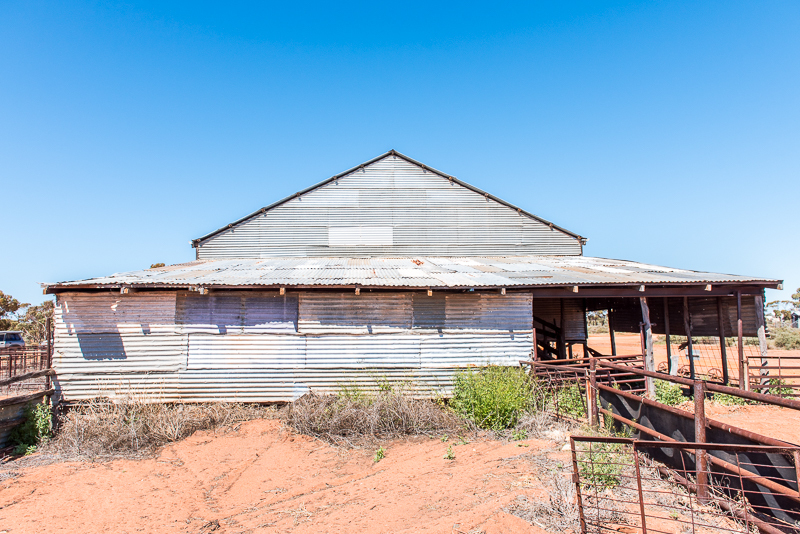 An old shearing shed at Credo, a station nearby Rowles Lagoon bought out by the government. The place to stay around Leonora is the free campsite at Malcom Dam. 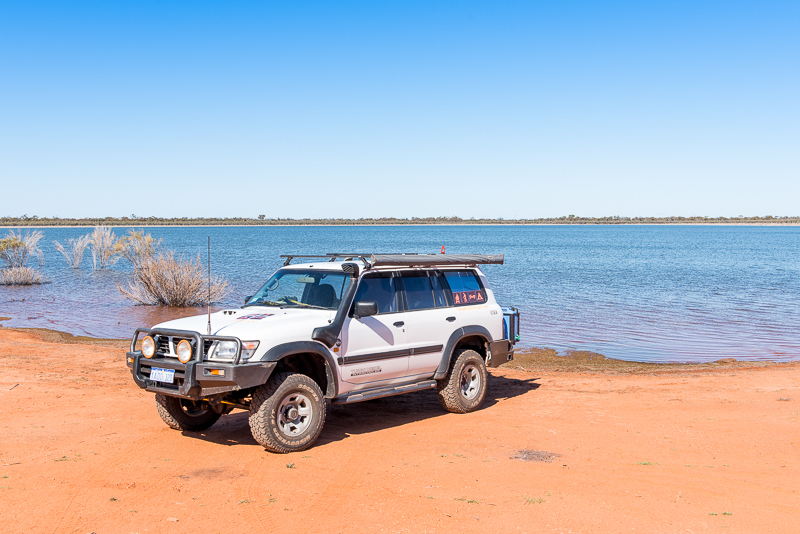 The Malcom Dam campsite is located only 10 kilometres out of town along Laverton-Leonora road. You can camp up on the wall where there are picnic shelters and bins, or you can head out around the back of the dam for a bit of privacy. You can guess which one we opted for! It’s not much, the dam was little more than a puddle during our visit, but it’s an alright spot. The weather didn’t look like it wanted to play the game though; clouds bunching up, phantom winds gusting through camp and dying off just as quick, and a spot of rain here and there. Maybe this dam might be a different picture in the morning! Malcom Dam…more like a puddle! But this is where I’m calling it a blog post for now. 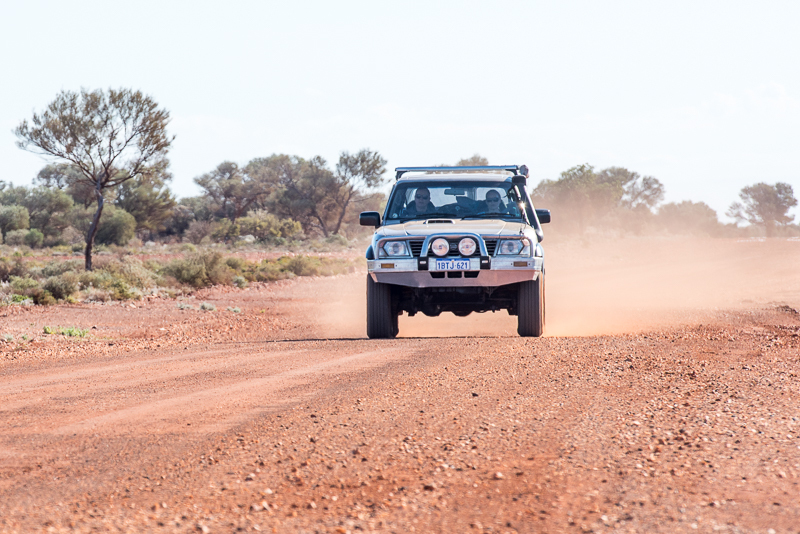 Keep an eye out for part two where we will be exploring Gwalia, Lake Ballard and Mount Elvire and sign up to the email newsletter to the right of this blog post to be kept up to date. There will be a video coming up too on YouTube, so if you’re keen for some outback scenery be sure to subscribe to the YouTube channel! That is an epic picture of the stars. Definately makes me consider checking it out. I wonder if my telescope would be any benefit since I can see the rings on Saturn from home. I've only really been trying to think of places near water where I can fail at fishing. This looks like a great alternative . Oh a telescope would be absolutely incredible out here! I too have a telescope but it's far too big to be lugging around with all my camping gear :p Yeah the desert is an awesome alternative to waterside camping! And if you're as crap at fishing as I am you've got just as much luck out there haha!